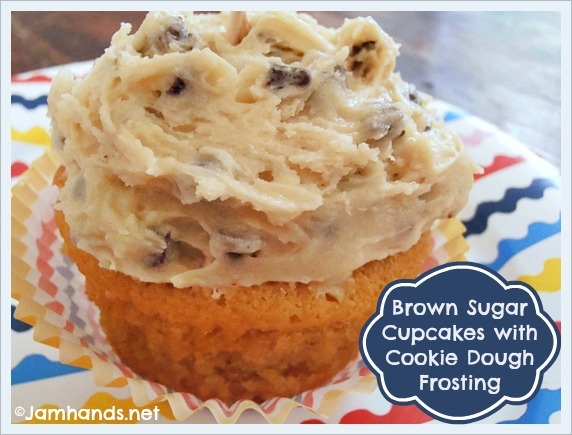 The best cupcakes I have ever made are these Brown Sugar Cupcakes with Cream Cheese Cookie Dough Frosting. When I saw the recipe for the frosting over at Chef In Training I pinned it immediately and began thinking of what kind of cupcake base might compliment the cookie dough best. 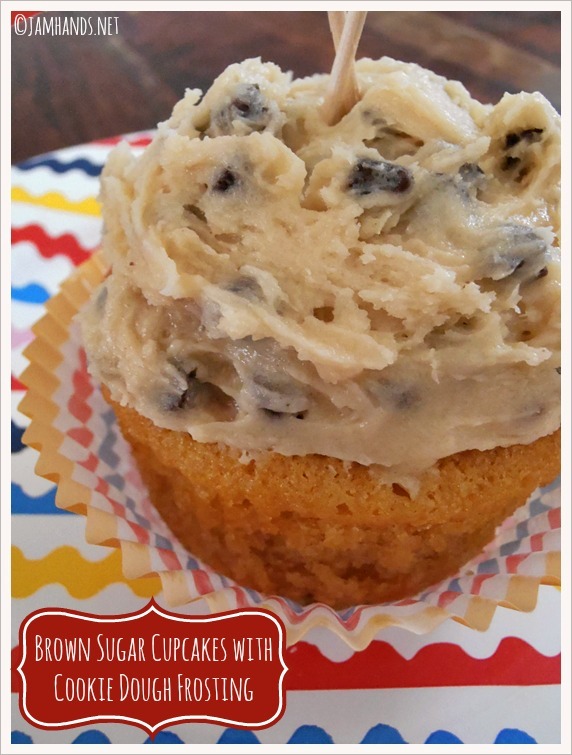 I then came across a recipe for Brown Sugar Cupcakes at Cupcake Bakeshop. 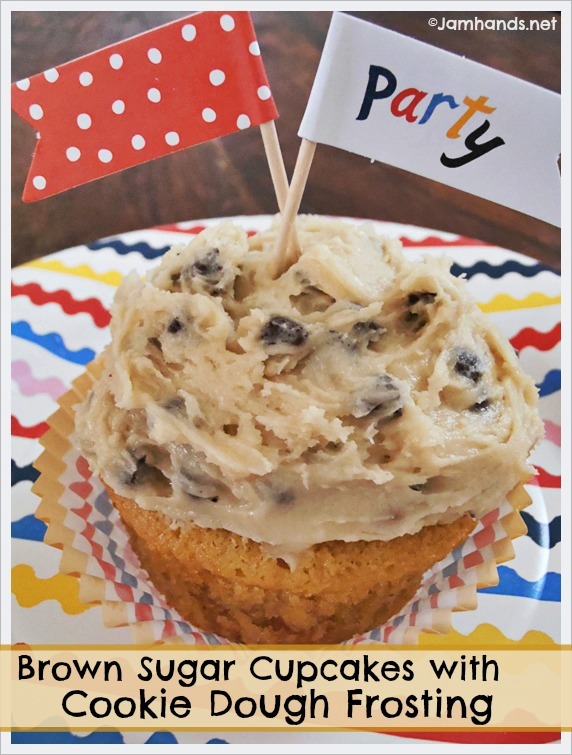 My thought process was that chocolate chip cookies have brown sugar in them, and what better to make as a base for the frosting than a delicious brown sugar cupcake. Both components, the base and the frosting are incredibly delicious. I almost cheated and make a cake mix for the base, but I'm really glad I didn't since the recipe for the cupcake is fantastic and well worth the extra dirty dishes and time to make it from scratch. Many thanks to Chef In Training and Cupcake Bakeshop for the recipes. Note: The original recipe for the cupcakes made 12, but since the frosting recipe will frost two dozen cupcakes, I doubled the cupcake recipe to match. Feel free to cut the recipes in half if you are baking for a smaller crowd. 1. Beat butter on high until soft, about 30 seconds. Add sugar. Beat on medium-high until light and fluffy, about 3 minutes. Add eggs one at a time, beat for 30 seconds after each. 2. Whisk together flour, baking powder, baking soda, and salt in a bowl. 3. Measure out milk and vanilla together. 4. Add about a fourth of the flour to the butter/sugar mixture and beat to combine. 5. Add about one third the milk/vanilla mixture and beat until combined. 6. Repeat above, alternating flour and milk and ending with the flour mixture. 7. Scoop into cupcake papers about half to three-quarters full. 8. Bake for 20-22 minutes until a toothpick comes out clean. Cupcake recipe from Cupcake Bakeshop. 1. Cream softened cream cheese and butter together in a large bowl. Add brown sugar, vanilla and Dream Whip and evenly beat together. 3. Stir in mini chocolate chips. Cover bowl with saran wrap and chill in the fridge for about 15 minutes. Frosting recipe from Chef In Training. These look delicious! Pinning! I hope you linked up at my TGIF party! I love to bake and LOVE dessert! These will definitely be next on my list to try. Can't beat anything chocolate chip cookie dough! YUM!